excellence, is the word. libraries should not exist, so this man would be free to devote his life to music. God, this is beautiful, David! You really inspire me, man! As Michael says, beautiful. Atmospheric and moody. Very nice. I love the sound of this, Raul. Even with the "unnatural" reverb it seems to reain a kind of "classroom" sound. Nice playing too! I love that the piano IS a reverb............your playing with the sonorous quality of the instrument and the convolution reverb is very cool. By the way, are you hip to the Piano Verb? It's a digital simulation of playing any instrument into the body of grand piano with the lid up........a very cool reverb. I've got it if you don't have it. @rick. no, i am not. is that a plugin verb? it would be cool to give it a try. thanx. This piece was very evocative for me. The combination field recording, artistry, low fi and, of course, verbs is really effecting. A very stimulating piece of music, Thanks! A piece for two banjos, played clawhammer style. The business of the interlocking banjo patterns conveys the bees. 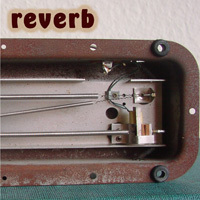 The added reverb sometimes obscures the patterns, creating small clouds of sound. after some rounds, I found my favorite track. such tangential but dynamic tempos at once. the mysterious dance of the central section, [eyes closed] echoing beneath the vaults of a moghul palace. dialogue between the two tracks, both with instruments and effects such as reverb tails, sometimes inverted, intertwine and interact, very effectively using the stereo field. hope to listen more music coming from jeff in the future. Samples music box and bass clarinet, and a selection of reverb plugins. There must be over 100 different reverb setiins, many of which overlap. An attempt to make a simple piece of music sound interesting by putting the instruments in a variety of different virtual spaces. i enjoyed this greatly. interesting and creative use of reverb in this track. Enjoyed the compositional aspect of this and the welcome mixture of instruments' timbres. Could have sworn the first note of the clarinet was a cello! Nice. the juxtaposition of bass clarinet and toy music box (which I seem to be obsessed with lately) is really wonderful.................this is a perfect match of chamber music composition sensibility in the digital age. Very nice!